Arbitration is one of the buzzwords of the moment, as the service jumps on the ADR bandwagon alongside mediation and collaborative law. The adherents of all of which, of course, hope to capitalise on the abolition of legal aid and consequent log-jamming of our family courts by hapless litigants in person. However, whereas mediation is promoted as a universal panacea by which all and sundry can avoid that logjam, arbitration is strictly for those able and prepared to spend money in order to escape the seething court-bound masses. Of course, as surely as night follows day a new legal buzzword is followed by a textbook on the subject, and here it is, cunningly entitled Family Law Arbitration. The book is in A4 format and comprises 83 pages, divided primarily into two parts: the main text (14 pages) and the appendices (65 pages). The main text, entitled Family law arbitration in practice consists of just three chapters: an introduction, complete with a case study, a chapter on procedure and a chapter setting out guidance. The appendices comprise the Family Law Arbitration Scheme Rules, the Arbitration Act 1996 (part 1 and schedule 1), Form ARB1 (Application for family arbitration), a check-list of matters for discussion at the first meeting, Arbitrator's terms of engagement, a draft letter to HMCTS requesting that the arbitration award be made into a consent order, the judgment in S v S (more on which in a moment) and a page settling out a few further resources. You can't mention arbitration without coming across the name Sir Peter Singer, and sure enough he has written the Foreword to Family Law Arbitration. Naturally, he doesn't miss the opportunity to extol the benefits of arbitration, exuberantly suggesting that it is not just for the very well off: "Arbitration flies and delivers results as well for those in steerage as for those who travel first class." The devotees of arbitration have, of course, been greatly encouraged by the President's recent judgment in S v S, which is gleefully referred to at several points throughout the book (including, of course, the book's tag-line) and Sir Peter happily calls it as a "tide-turning case". The author, Dennis Sheridan, clearly shares Sir Peter's enthusiasm for the subject. The case study in the first chapter, which is based upon a real case in which he was involved, concludes: "I can honestly state that arbitration certainly reduced the anxiety and the misery for the clients, and disposing of their case so satisfactorily and swiftly leaves me better able to deal with the next matrimonial client who comes through my door." In the third chapter he sets out thirteen benefits of arbitration, ranging from informality to speed and confidentiality. 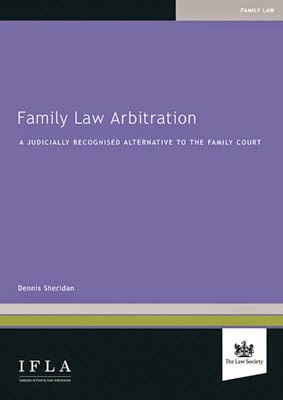 Never having been involved in a family arbitration myself (such exotic things didn't exist when I was practising) it is difficult to comment upon whether the book contains all that anyone considering arbitration needs to know. The only omission I can think of is that there is no mention of how much an arbitration actually costs. I have heard of a figure in the region of £1200, although obviously this depends upon such factors as the arbitrator instructed, the venue etc..
On the subject of money, Family Law Arbitration costs £79.95, which may be considered a little steep for such a slim volume, especially as many of the resources it contains are feely available online. Still, it is handy to have all of those resources in one place, particularly if you are out of the office. 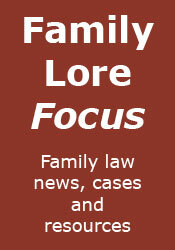 Family Law Arbitration can be purchased from the Law Society Bookshop, here.